Different constructions, thicknesses and configurations of galvanised wire rope can be ordered from Rope Services Direct. If our 6×19 rope takes your fancy, you can order it with a 5mm diameter and get plenty of noteworthy benefits to boot. 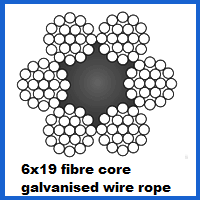 Below we have looked at 5mm 6×19 Galvanised Wire Rope in more detail. While not all wire rope is used for lifting, it is still worth noting the load limit that is associated with any product that is being considered. In the case of this 5mm 6×19 rope, a capacity of over 1.5 tonnes is provided. Of course this type of rope may be destined for other uses. Its galvanised surface stops rust from forming when moist atmospheres are encountered. This means it will not corrode outdoors, nor stop looking its best if a bit of salt water comes into contact with it. From fencing and balustrades to garage door cabling, a thin yet strong rope like this can do much more than you might imagine. Snapping up some 6×19 rope from RSD gives you the opportunity to include a lot more than the rope alone as part of your order. We manufacture and sell bespoke assemblies using ropes of all sizes and types. If you simply require a few fittings to add, this is also easily done when you get in touch. We are here to help and can give you the guidance you require when you call 01384 78004 or email our team via our site. 5mm 6x19 Galvanised Wire Rope Overall rating: 5 out of 5 based on 6 reviews.